Every Noise at Once has long existed in shades of gray. This isn't because I don't like colors. I've actually tried a few different ways to add color, mostly through inelegant expedients, but none of them seemed to me to be adding more clarity than confusion. The idea is to semi-subliminally surface some of the other analytical dimensions from the underlying music space, beyond the two that drive the XY axes, so that there's a little less visual flattening. 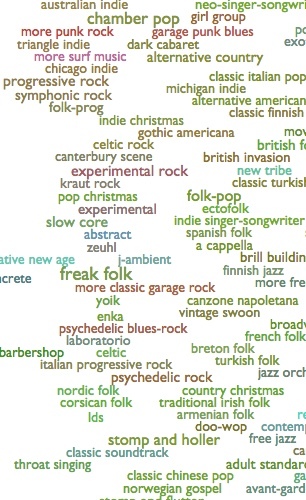 For example, in the section on the right, above, you can see the reddish color running from "garage punk blues" to "experimental rock" to "more classic garage rock" and "psychedelic blues-rock", and the light blue linking "alternative new age" to "abstract" to "new tribe". These are good associative threads. Logistically, this works by mapping three additional acoustic metrics into the red, green and blue color-channels. I arrived at this particular combination through not-at-all-exhaustive experimentation, so maybe I'll come up with a better one, but for the moment red is energy, green is dynamic variation, and blue is instrumentalness. I don't recommend trying to think too hard about this, as the combinatory effects are kind of hard to parse, but it gives your eye things to follow. As data-presentation this is rather undisciplined, but as computational evocation it seems potentially interesting nonetheless. Which you could say of music, too. As part of a conference on Music and Genre at McGill University in Montreal, over this past weekend, I served as the non-academic curiosity at the center of a round-table discussion about the nature of musical genres, and of the natures of efforts to understand genres, and of the natures of efforts to understand the efforts to understand genres. Plus or minus one or two levels of abstraction, I forget exactly. And this is all kind of fractal, so you could search-and-replace Thing with Post Thing or Pop Thing or whatever, and after a couple iterations you can quickly end up with Post-Neo-Traditional Pop Post-Thing. And it would be awesome. At Spotify, where I work, we have listeners in a large and growing numbers of countries around the world. 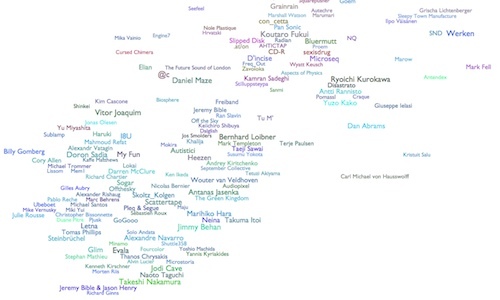 You might theorize that people in different countries listen to different music. You might be curious to hear this music. If you are me, you might be really curious, to the point of a kind of obsessive, consuming fear that there is awesome and bizarre and wonderful music in, say, Estonia, that you're not hearing. We do, in fact, have per-country top-track charts in Spotify itself. These measure the absolute popularity of tracks among the sub-population listening in a given country. Statistically, though, these charts tend to be fairly well dominated by global hits. This isn't a technical flaw, but it does mean that those charts are not especially useful for the purpose of musical tourism. When I say I want to hear what they're listening to in Estonia, I mean that I want to hear what they're listening to Estonia that, proportionally speaking, nobody is listening to anywhere else. I want to hear the music that is most uniquely Estonian, or more precisely the music that is most uniquely loved by Estonians. So I've been experimenting with code to generate the kind of additional alternate chart that I mean, measuring the most distinctive listening of a country. It's not perfect, and the occasional global hit wanders in due to emotionally irrelevant factors like regional licensing contingencies. But for the most part these charts do appear to be rather effectively getting past the global to the local. I was going to share an alphabetized list of these, for anybody who shares my curiosity. But I have this code to produce visual maps of music groupings, and it's just as easy to feed it countries as it is to feed it genres. And thus I've done the somewhat bizarre exercise of producing a visual remapping of inherently geographic data using non-geographic coordinates. This is a readability-adjusted scatter-plot of two acoustic variables averaged across a few thousand of the most popular and representative songs from each country. The vertical axis is a metric quality we call "bounciness", so the countries at the top are characterized by denser and more atmospheric music, and the countries at the bottom are characterized by sparer music with spikier beats and more space between them. E.g., the constant roar of atmospheric black metal or the slow humming whir of classical organ music would be at the top, and the jumpy beats of hip hop or the pulse of reggae would be at the bottom. The horizontal axis is another score we call "organism". The countries towards the left are characterized by music with more electric arrangements and/or more mechanical rhythms. The extreme of this quality gets you relentless techno. The countries towards the right are characterized by music with more acoustic arrangements and/or more human and variable rhythms. The extremes of this get you jigs and reels, or sitars. 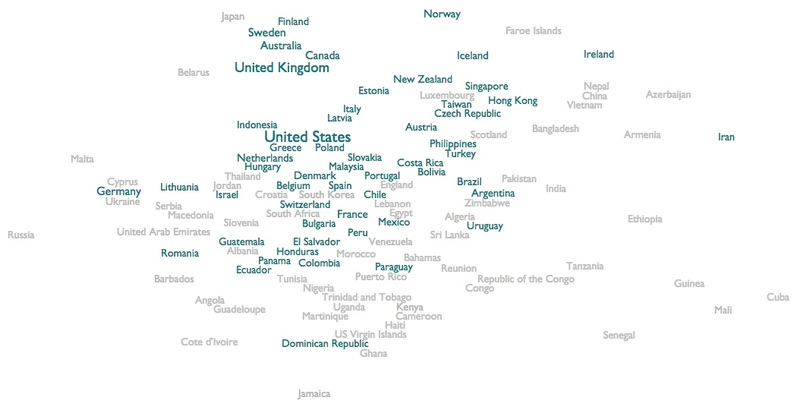 But what's intriguing here, obviously, is not where individual countries appear, but which countries cluster together. Japan, Australia and Canada all basically fall into acoustic Scandinavia. Africa and the Caribbean form a unified acoustic southern hemisphere. Malaysia is acoustically closer to Slovakia than to China, and Lebanon is acoustically closer to South Korea and Mexico than to Iran. I feel like we are detecting at least the faint echoes of a kind of cultural truth. Click any country to see the calculated playlist of the 100 most distinctively popular songs in that country. You need Spotify for this to work, and as you'll discover, in some cases international publishing rights work counter to personal curiosity, and less than 100 will actually be available for you to stream. If you're extra-curious, in Spotify Preferences you can uncheck "Hide unplayable tracks", and then you'll at least get to see all 100. Estonia turns out to be pretty much exactly as awesome as I imagined it had to be if I could only hear it. We used to call playlists "compilations", and they used to be published on big flat pieces of plastic. Weird. The one that formed the core of my personal education in "punk" music was a 1984 double-LP from Cherry Red records called Burning Ambitions: A History of Punk. 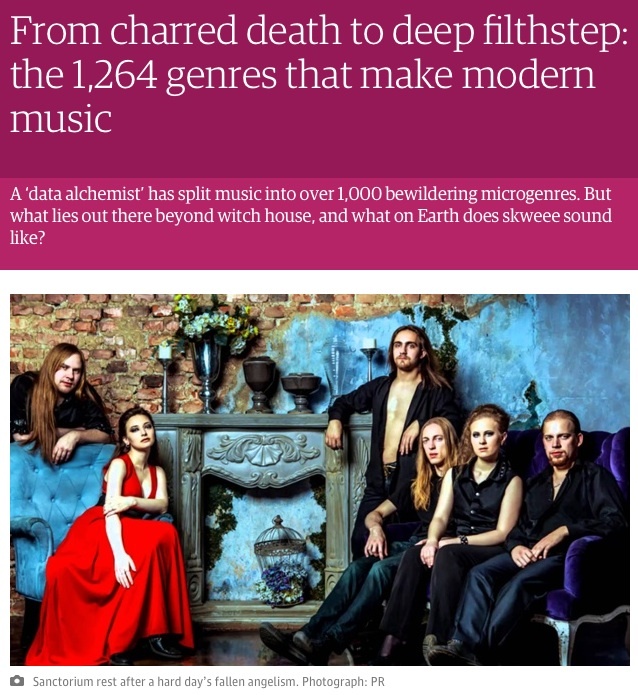 The Guardian today published a piece by Rob Fitzpatrick that I think is now my favorite thing written about my genre map, because instead of being about the map, it's about the music he found using the map. One of the things I've been experimenting with at work is finding music by how distinctively it appeals to particular audiences. Mostly we're interested in regional and demographic slices, but out of idle curiosity I tried running the same code against hours of the day. That is, for each hour in the day I calculated which songs were most disproportionately played during that particular hour as opposed to in general (by US listeners). From this I was able to assemble a compressed 24-song time-lapse exaggeration of the sounds and biases of the American day. Our caricatured day starts at dawn with a gentle, soothing Jonsí wake-up. It gets a little preachy (literally) over breakfast, but then Seinabo Sey and Shawn Mendes slowly add some restrained alertness as the coffee takes effect. Spoon and Jason Aldean and Sam Smith carry us unhurriedly through late morning and lunch. Early afternoon is, apparently, the official time-slot for imported Australian boy-pop, as 5 Seconds of Summer and Troye Sivan sigh and swoon for a couple songs. I can't really explain what O.A.R. is doing after that, but then it's a solid block of modern (and largely not child-suitable) pop/hip-hop straight through dinner (including, amusingly, a song called "2AM" that is very definitely more popular at 2PM than 2AM). Eventually I guess the hip-hop kids go to bed, and the indie/pop-punk kids stay up a little later to briefly rock. Then it's nighttime, and we get increasingly meditative with Jon Hopkins, Hans Zimmer and Ludovico Einaudi for a while before resorting (and the data really do indicate this) to actual background noise for a couple solid restorative hours of REM sleep. On Friday, September 26, I'll be giving a "seminar" on music exploration and data alchemy at the Centre for Interdisciplinary Research in Music Media and Technology, at the Schulich School of Music at McGill University. 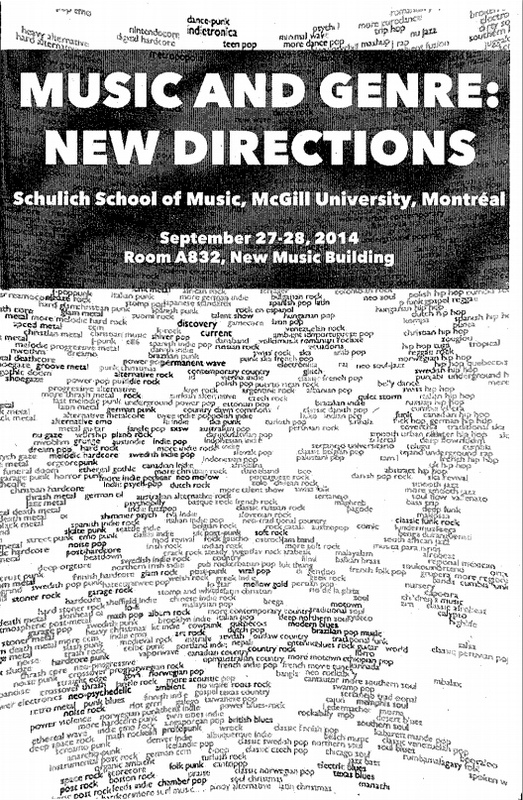 On the 27th and 28th I'll also be participating in a McGill-hosted conference called Music and Genre: New Directions. Sometimes in blog posts I mention songs. Like Clockwise's "War Story Part One", which is really good. You should listen to it, seriously. In fact, I would like to help you listen to it, not least because there's really no reason you should listen to it just because I say so, so listening to it better be really easy. The fancy way would be to go find the track on Spotify, right-click it and pick "Copy Embed Code", and then paste that code into my HTML to get this embedded Play button. But sometimes I'm just mentioning a song in passing, or in some particular formatting like a table with other stuff, and the fancy embedded thing isn't what I want. It would be nice to also have a lower-overhead way to just mark a song-reference in text as a song-reference, and let some music-intelligence thing somewhere figure out how to actually find and play it. So I made a first version of such a thing. It's pretty crude, in that you have to know about editing HTML, and be in an environment where you're allowed to. And it just plays a :30 sample, it doesn't log you in and play the whole song. But the HTML itself, at least, is very simple. So if you have a need for which those are acceptable conditions, and you want to try it, here's how it works. Clockwise "War Story Part One"
When you play an excerpt, a little musical-note link also gets magically inserted, which you can use to go hear the whole song on Spotify if you want. That's all I've got so far. If you try it, please let me know if it works for you, in either the functional or appealing senses. I'll be here thrashing around to "Snake Jaw" by White Lung. 1: If you have a large page and want things to be playable before the whole page finishes loading, you can attach the onclick handlers yourself instead of waiting for them to be attached automatically. Just add onclick="playmeta(this)" to the same elements you marked with class=play. A representative track from the album will be chosen automatically by extremely sophisticated and complex logic, by which I mean that it will pick the first track unless the first track is very short and the second track isn't, or the first track has "Intro" in the title, in either of which cases it will pick the second track. Fancy. This morning I was listening to the Madden Brothers' "We Are Done", which came up on The Echo Nest Discovery list this week. I have the sinking/tingling feeling, and we'll see if I'm right because this isn't necessarily one of my actual talents, that this song is going to become ubiquitous enough in my environment that I'll look back wistfully on listening to it entirely voluntarily. But listening to it also made me think about Fun's "We Are Young" and Pitbull and JLo's World Cup song "We Are One" and Taylor Swift's "We Are Never Ever Getting Back Together". We are, we are, we are, we are. This kind of pointless internal word-association used to dissipate harmlessly inside my head. But now I have the resources to indulge it at scale. 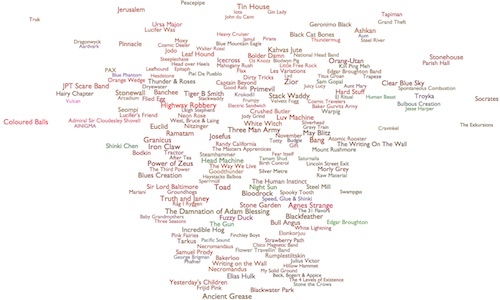 So I made a Spotify playlist of 100 songs that follow the title-pattern "We Are [something]". And then I realized there were more of them, so I made a playlist of 1000 of them. And having done that, it was trivial to make similar playlists for "I Am [something]", You Are [something]", "He Is [something]", "She Is [something]" and "They Are [something]", so I did that, too. And then I have a thing that will summarize the contents of a playlist in various ways, so I ran it on these because why not? The first thing one finds is that I, You and We songs are way more prevalent than She and They songs. And although there are plenty of He songs, they are disconcertingly overwhelmingly religious, which is kind of different. So I kept the He/She/They playlists for your amusement, but I only analyzed I, You and We. 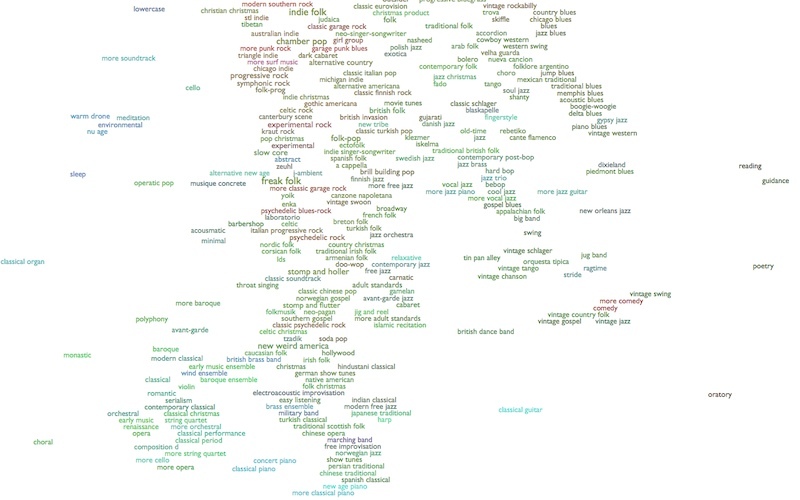 The I/You/We scores here are average values across the 1000 songs for each title pattern. Most Echo Nest metrics are normalized to be a unit-less decimal value between 0 and 1. Loudness is customarily measured on a weird negative scale, Tempo is in beats-per-minute, and Year is obviously in years. The Power column measures the discriminatory power of each metric. So the two metrics that discriminate best between these three sets of songs are Acousticness and Energy. The metrics with the least power to discriminate between these sets are Valence (emotional mood), Bounciness (atmospheric density vs spiky jumpiness) and Danceability, all of which vary much more widely within each category than between them. Comparing the whole set to my earlier measurements of genre, year, popularity and country shows that the pronoun sets are about as distinct as sets based on country of origin, and more distinct than sets based on popularity, but less distinct on the whole than sets based on year or genre. Which is a lot more difference than I expected, actually, particularly between You and We. Individual songs can have any individual character, but taken as an aggregate, "You Are" songs are significantly calmer, more acoustic and more organic in their rhythm. "We Are" songs are more energetic, more electric, notably more mechanically driven, and louder. That is, we sing more tender songs to each other, and more anthems about ourselves together. We also seem to be singing more We Are songs lately. Or, to be more precise, because these 1000-song subsets are selected by popularity, more-recent We Are songs are a little more popular now in the aggregate. Attentive observers may recall that my earlier study showed correlations between time and both Acousticness and Energy over the years from 1950 to 2013. But both song-sets here are largely more-recent songs from well after the period of greatest historical change for either metric, and the magnitude of difference is significantly larger than the degree of variation predicted by year alone. The I Am songs fall into an interestingly conflicted middle ground. They are more acoustic and less energetic than the rousing We Are anthems, but not as tender and sensitive as the wistful You Are odes. But while the I Am songs are closer to the You Are songs in rhythmic regularity, they're closer to the We Are songs in tempo. So while you might reasonably expect We to be a compromise between I and You, this brief study clearly and crushingly demonstrates that the pre-computational centuries of the study of the psychology of self have been a sad speculative waste of time. Music and math prove that our individual selves float suspended between what we project onto others and what we dream that we could achieve together. Site contents published by glenn mcdonald under a Creative Commons BY/NC/ND License except where otherwise noted.